It's been hot here. I mean hot. So I've been trying to find fun new ways to get my hair off my neck. Here's a super easy (and pretty) style that I found. It's so easy to create. Simply divide the hair into three sections at the nape of the neck, then twist each section until it wraps back on itself and pin in place leaving ends loose. That's it! 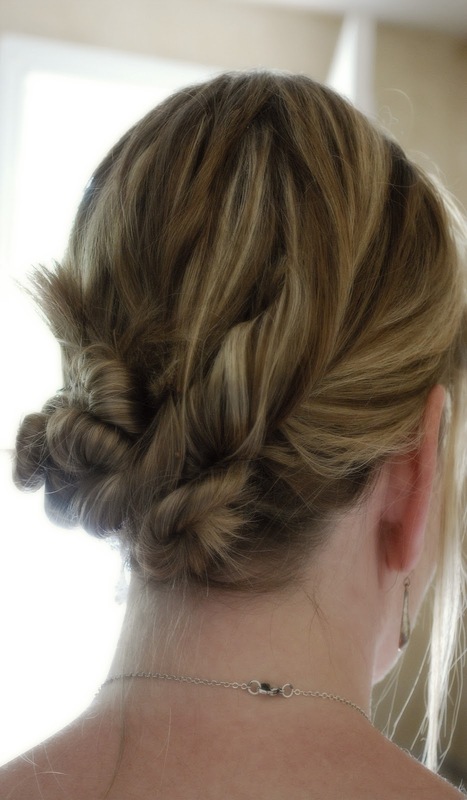 If you've got long hair, this could just be your new go-to summer style...I know it's mine! Frugal Friday goes live tomorrow at 8:00 pm MST as usual. And we'll be moving this weekend...so look forward to many decorating posts to come! Happy moving! Thanks for going out of your way to host when you are in such an uproar this week. so cute!!! will try it for sure. Oooh, that's lovely!! Will definitely try that, am getting bored with my usual styles. LOVE it. I am going to try it. It beats the same ol' boring bun everyday lol. Cute! I say one similar to that on Pinterest and did on my daughter. She looked adorable. Makes me almost wish I didn't chop my hair off for summer. Have fun moving. It's the unpacking I love!! I love your hair!! It's so cute!! Super Cute! Good Luck with your move...looking forward to seeing your new decorating updates! Great hair style, have done something similar but like your version better. Oh, I've got to try this, such a cute look! This is adorable. Did you pin it with regular ol' bobby pins?? Super cute! I don't know if my hair is long enough for that but I'm definitely going to try it! This is so cute! Do you think it would work the same if I have really wavy and thin, at times unmanagable hair?